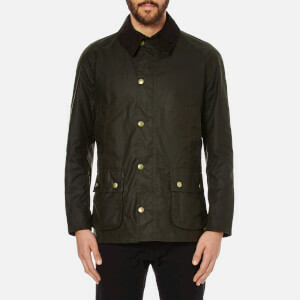 Men's wax jacket from the World Tour collection at Barbour International. 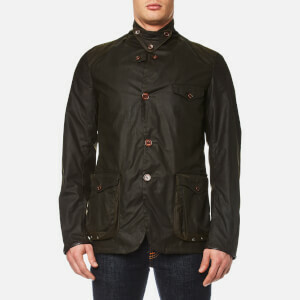 A re-work of the iconic 'Enfield' jacket, the 'Duke' coat is cut from lustrous 6oz Thornproof wax with a subtly tailored, relaxed fit, and showcases classic biker-inspired details, including a funnel collar with strap fastening, a central zip fastening with studded storm flap, and elbow patches for a heritage feel. The robust design is complete with four, studded flap patch pockets to the front and adjustable, corduroy-lined cuffs for unrivalled comfort. 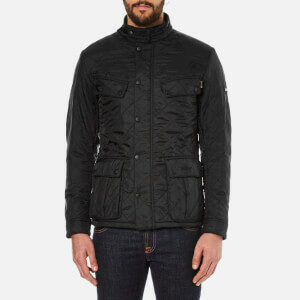 Lined in warm, quilted nylon, and finished with a zipped internal pocket and subtle branding. Great coat, that can be dressed up or down. 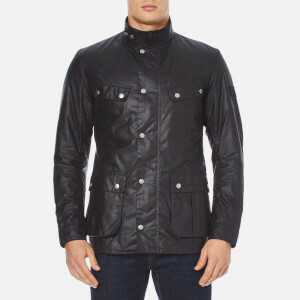 The design is more modern compared to the standard Barbour design.